Logan tells Sean Cassidy and Kurt Wagner of his past, some “twenty years back. It was a different time of life – before I met Jamie Hudson or got into the hero business. Canadian Intelligence had me workin’ the odd job, but they knew how I felt about my free time, so they didn’t ask any questions.” Logan spends much of that free time at the Hotel St. Cecil bar in Calgary, a sleazy saloon run by a woman named Cracklin’ Rosa. There, Logan drinks heavily and takes on all comers in arm wrestling, a pastime that Rosa uses to her advantage by taking bets (and encouraging Logan to play it up to help the odds). Logan never loses, and occasionally engages sore losers in fisticuffs, again playing to the crowd so Crackin’ Rosa can clean up. On one especially memorable night, Sean Cassidy, as an agent of Interpol, uses Logan’s activities as a diversion to arrest some international criminals. Logan reminds Sean Cassidy that they’ve known each other since Cassidy worked for Interpol. After realizing that an auto accident has been staged with bodies burned beyond recognition to cover the kidnapping of Professor Xavier, Logan tells Peter Rasputin (Colossus of the X-Men) that he has staged “more than a few” car accidents of his own. Logan is on assignment aboard a pirate junket working the waters near Madripoor, ostensibly from Canadian Intelligence. James Hudson, as journeyman scientist for Am-Can Petroleum, pitches Mr. Jaxon, a senior Am-Can executive, the concept of a mechanized suit. After building the mechanized suit for the Research and Development division of Am-Can Petroleum in Edmonton, Alberta, James Hudson argues with Jerry Jaxon and an American General about the planned military applications of such a suit. Hudson notes that he has been working on the project for four years and that the military will use it in Southeast Asia, an apparent reference to Viet Nam. Frustrated with the turn of the events, Hudson uses his mechanized suit to break into the company’s maximum security safe and destroys his original blueprints. He then ditches the suit after his successful test flight and removes the cybernetic helmet, disabling the project. Heather McNeil, Mr. Jaxon’s secretary, resigns over the sale of Hudson ‘s armored suit to the U.S. military. As technicians work to figure out Hudson’s mechanized armor at the Am-Can facility in Canada, agents from Hydra break in and steal it. The President of the United States and the Prime Minister of Canada secretly meet in Ottawa and agree to support a joint U.S.-Canadian mission to retrieve the armor. 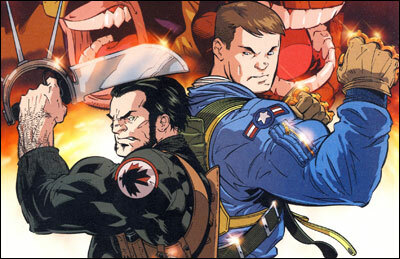 Logan from Canadian Special Services and Rick Stoner from the CIA are summoned and given orders to recover the armor. At the U.S.-Canadian border, Stoner and Logan stop a suspicious-looking truck. As Stoner checks the driver’s paperwork, Logan investigates the back and discovers a host of armed Hydra agents guarding the armor. With only a big knife and his fists, Logan overwhelms the Hydra agents and with Stoner’s help, the armor is recovered undamaged. It is interesting to watch Logan as he challenges authority, showcased by his disrespect when meeting the Prime Minister and the President, and his attitude toward the straight-laced Stoner. Logan also shows a preference for cigars, big knifes and running headlong into trouble. As James Hudson contemplates his future, Heather McNeil visits him at his apartment. When she sees the cybernetic helmet on his table, she realizes that he was responsible for disabling the armored suit. She quickly arranges for him to meet with government officials to rectify his situation. After twelve hours of meetings, Hudson is able to prove that the cybernetic helmet was his property prior to his work with Am-Can Petroleum. A Canadian government official, Frank Hulme, clears up all of the remaining issues and hires him, effective retroactively. Hudson is then ushered in to meet the Canadian Prime Minister who requests that he lead up Research and Development for the Ministry of Defense, a project that will lead to the creation of Department H over the course of the next three years. Logan tells Nick Fury they have known each other since his days with Canadian Intelligence. This being before Logan regains all of his memories, he clearly does not realize that he first met Nick Fury during WWII. And more interestingly, Nick Fury apparently does nothing to persuade him from that view. Logan tells a young SHIELD agent that he worked for the Puzzle Palace with Nick Fury during the Cold War. The Puzzle Palace was the nickname for the National Security Agency (NSA), the cryptologic intelligence agency of the United States that was founded in 1952. Carol Danvers enlists in the Air Force on her eighteenth birthday. After basic training, she is assigned to strategic operations and partners with her first teacher, Colonel Michael Rossi. In conversation taking place in the 1950s, Logan notes that he has worked extensively in the past with Carol Danvers, and the two are close friends. Kaare Andrews and Walden Wong, Ben Grimm and Logan #1. Logan drives from Canada to Nellis Air Force Base in Nevada for a top-secret mission, where he is buzzed by an experimental Phantom jet, sending his car skidding off the road. As he recovers control of his Lotus 7, Logan follows the jet back to the base, breaks through the security gate and decks the pilot. The ensuing fight is broken up by MPs who throw both combatants in the brig. Logan recognizes the pilot as Ben Grimm, who once flew him from Ottawa to Washington D.C., but a jail brawl breaks up their reunion. In the process of the fight, Logan shows his prowess by snapping an over-sized bully’s knee with one quick punch. 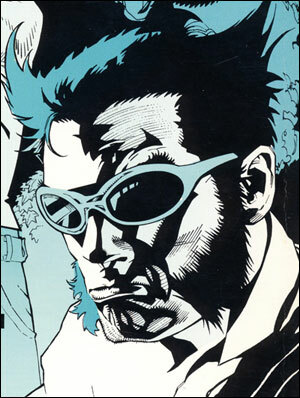 The brawl ends when Colonel Fury arrives to brief both Grimm and Logan on their top-secret “suicide” mission. Tony Stark (later to become Iron Man) provides technical background on the mission, specifically that the Soviets have erected 20 ultra-low frequency transmitters near Vladivostok, aiming them at the United States. Ben Grimm’s mission is to pilot an experimental YB-49 Northrop Flying Wing close enough to the transmitters to measure the wave output. Carol Danvers is introduced as the Department of Defense technical expert for the mission, but Logan reminds her of their recent meeting when she operated out of the Defense Intelligence Agency. Danvers plays it cool, telling Logan to keep that as their secret. Several hours after takeoff, as Logan reads his ultra-top-secret orders, the plane’s incursion into Soviet airspace is discovered by Special Agent Natalia Shostakova of the KGB (previously known as Natasha Romanoff/Romanov and later as the Black Widow), who orders them to land immediately. Logan accuses Ben Grimm of tipping off the Soviets, and the two get into another fight. Carol Danvers takes control of the plane and attempts to bluff her way past the Soviet jets. When the Soviets fire upon the plane, it becomes obvious that Carol’s gambit has failed and that Ben Grimm is no traitor. Logan , while quite violent, is very much under control during the fights of this miniseries. The Logan from the post-Experiment X phase is consistently on the edge of deadly berserker rages and the removal of this series from that later chronology cleans up the evolutionary flow of his character quite nicely. The Lotus 7 that Logan is driving was manufactured from 1957 to 1982 and is best known as the car driven by Patrick McGoohan in “The Prisoner.” This car is not seen again until the events of just prior to Experiment X when Logan’s skeleton is bonded with adamantium. In fact, Logan has no memory of owning a Lotus 7 until he researches the Experiment X site as an X-Man. The YB-49 Northrop Flying Wing shown in this issue was first flown in 1947, and the project was canceled in 1948 when two test pilots were killed. It is possible that a second experimental version of this plane was used for this mission some ten years later. As for Logan’s confrontation with Carol Danvers, this series of events makes sense. Logan claims to have met Carol as an agent of the Defense Intelligence Agency which reports up through the U.S. Air Force. Carol Danvers began her career in Air Force Intelligence and it is not until later that she moves to the CIA. Logan must have met her and Nick Fury on a previous undisclosed occasion in Washington, D.C. with the DIA, possibly through Colonel Michael Rossi. In regards to Logan ‘s previous meeting with Ben Grimm, it is conceivable that Ben had flown Logan from Ottawa to Washington, D.C. on that same previous occasion. After Logan and Ben Grimm call a truce to save the plane, they realize that the mounted guns are out of ammunition and the parachutes removed, presumably an attempt to prevent an international incident in the event of detection. With few options remaining, Grimm lands the plane near one of the Soviet transmitters, while Carol Danvers sets the self-destruct on the plane and removes the black box that successfully recorded the ultra-low frequency waves. Logan locates the two working machine guns to provide cover for Carol who sprints to the nearby forest line. As Carol makes good her escape, Logan and Ben are faced with an overwhelming Soviet force and little ammunition to defend themselves. Before long, Ben and Logan are captured, and Natalia Shostakova of the KGB overrides the self-destruct codes on the Flying Wing, securing a prize for the Soviets. Logan and Ben are transported to a prison train bound for Moscow and the Lubyanka prison when Logan overhears that a strongbox carrying the rare metal used to power the Soviet Red Storm project will be transported on the same train. As fate would have it, Logan’s secret orders are to steal that rare metal, prompting him to start a brawl in the prison car. When the Soviet guards arrive to investigate, Logan and Ben drag them into the car and escape through the top of the train making their way to the engine where the strongbox is held. Pulling the strongbox to the roof of the train, Logan notices a small red plane buzzing the train. It’s Carol Danvers in a stolen Yak observation plane. It is during Logan’s and Ben’s fight with the Soviets that Logan’s non-use of his claws is most pronounced. He pulls out two knifes to fight for his life. If he had his adamantium claws, there is no doubt he would have used them. And in the prison train, it would have been much simpler to make their escape with use of his claws. It is clear that Logan did not have claws for this adventure which clearly places these events before those of Wolverine #-1. Kaare Andrews and Walden Wong, Ben Grimm and Logan #2. As Carol Danvers barrels down on the prison train in the Yak observation plane, Logan and Ben are able to grab a hold of the plane’s skis, though Logan’s grip is one-handed, due to the Red Storm strongbox dangling from his other hand. As Carol pulls up, she finds her small plane in the flight path of the Flying Wing, now under the control of the Soviets. As she spins the plane to avoid a collision, Logan begins to lose his grip on the ski. With little to lose, Carol performs another roll that throws Logan and the strongbox onto the wing of the Northrop YB-49. While Logan tries to maintain his precarious position on the outside of the wing, the Soviet pilots open fire on him. Losing his temper, Logan slams the Red Storm strongbox through the cockpit window, decking the pilots and giving himself an entrance to the inside of the plane. Once inside, Logan realizes that he cannot successfully pilot this strange plane by himself. As fate would have it, Carol is able to deposit Ben onto the Flying Wing mere moments later, and Logan drags him inside to pilot the plane. Before they can celebrate, two Soviet fighter jets arrive on the scene and begin to pummel the Flying Wing. Carol destroys one jet in a mid-air collision with her Yak, but her plane is critically damaged and begins to nosedive. Ben follows the diving Yak with the Flying Wing, and Logan manages to grab her through the shattered cockpit window just before her plane hits the ground. As the remaining Soviet jet moves in for the kill, piloted by Natalia Shostakova of the KGB, her superior recalls her to base, not realizing how close she is to victory. With that, Ben pilots the plane back towards the United States. Logan adds cryptically that their mission is only half-completed, which starts yet another fight between Logan and Ben. The ending suggests that Larry Hama had another mini-series planned to follow up on this one, but nothing ever came of it which is a shame, for this series, despite its faults, was a lot of fun. Logan remembers a time before the creation of SHIELD when he tracks a terrorist assassin from Canada to Australia. Locating the secret terrorist training camp in the Tanami Desert, Logan destroys the camp. During his escape, Logan is shot and left for dead. David Nanjiwarra of the Australian Secret Security and Intelligence Organization (ASIO), his cover blown by Logan’s actions, finds him and tends to his wounds. After experiencing the prejudices against the aboriginal Nanjiwarra first hand while they trek back to civilization, Logan suggests that an international spy organization that is rumored to be in development (SHIELD) might be a smart move for the Nanjiwara. Logan notes that Doctor Giloski from the Ottawa General Hospital had patched him up on several occasions. Potentially these visits occurred when Logan was unaware of his mutant abilities and lacked official medical services. In a conversation between Logan and Eugene Judd (Puck of Alpha Flight), Logan mentions that they were on opposite sides during the mess in Maracaibo, Venezuela. This is probably a reference to the revolution in January 1958 when General Marcos Perez Jimenez was overthrown and a civilian democracy installed. In 1958, Logan is on a mission in the jungles of Cuba, monitoring Fidel Castro and his band of revolutionaries. While searching for a man named Hendricks, Logan runs into three “Agents of Atlas,” Jimmy Woo, Gorilla Man and M-11, the human robot. With both sides wary of the other, a fight breaks out resulting in Logan slashing at Jimmy Woo’s neck with a knife. In response to the knife slash, M-11 drops Logan with an electric blast, apparently killing him on the spot. But Jimmy Woo reveals that Logan actually saved his life by killing a mutated bug that was crawling on his neck. Logan revives and proves to be very much alive, revealing that he is searching for a man named Hendricks from the previous team that was sent in to investigate these mutated bugs. Just then, a flare bursts overhead, and Logan with the Agents of Atlas track down Hendricks who is alive but surrounded by a swarm of the mutated bugs. At Hendricks behest, the mutated bugs, attempt to mind control Logan and the Agents of Atlas by attaching themselves to their cerebral cortex. M-11 destroys the bugs with a blast, and Logan kills Hendricks. When Jimmy Woo tries to take Logan back for debriefing, Logan blows up a bomb and disappears into the jungle. As noted previously, Marc Cerasini’s Wolverine: Weapon X (a prose novel from Marvel Press) is an exploration of Barry Windsor-Smith’s ‘Weapon X’ storyline. Marc Cerasini claims in an interview with UnderGroundOnline that, “Marvel also provided a really amazing timeline/bible for the character Logan/Wolverine which I used heavily. There are some real secrets in that document and I revealed a few of them in the novel.” But there are significant problems with the novel’s chronology that cast doubt on the book’s veracity. The story clearly takes place in present day instead of during the Cold War as originally intended, referencing the recent space shuttle disaster, weapons of mass destruction, North Korea’s nuclear program, not to mention the commonplace nature of extremely modern computer and military technologies. More problematic is that the novel ends quite differently than the original Weapon X storyline, killing off several characters who survive Experiment X and significantly impact Wolverine’s life at a later date. For these reasons, I have deemed that Wolverine: Weapon X by Marc Cerasini does not take place within the traditional Marvel continuity. However, I include new revelations about Logan ‘s past from this novel for the sake of completeness, presenting that information in red. Logan remembers when he was with the Defense Ministry working out of the Ottawa branch of the Canadian Intelligence Service. It is then that he meets and is partnered with Neil Langram. Their first mission is to infiltrate the Korean Peninsula, near Sook Reservoir. They are to use HAWKs (High Altitude Wing Kite) developed by SHIELD, devices that Logan is apparently familiar with. Logan admits that he knows Hideki Musaki, a Yakuza, and Langram insinuates that Logan is known as Patch in the Far East, also referencing Cracklin’ Rosa’s. Logan, dropped from a MC-140, freefalls into North Korean airspace strapped to a SHIELD HAWK (second generation model). Approaching the North Korean facilities surrounding a dam, Logan, accompanied by his partner Neil Langram, is on a mission for Canadian Intelligence to locate Weapons of Mass Destruction. As he lands, Logan smashes into someone waiting from him on the ground below. Logan rolls across the landscape with the stranger who he collided with. Finally coming to a halt on the edge of a cliff, Logan discovers the stranger is an agent of the Japanese Special Assault Team, Miko Katana. Through a French mole in Canadian Intelligence, she learned of Logan’s mission and requests his help to enter the nearby dam facility to rescue a kidnapped Japanese scientist. As Logan and Miko reconnoiter, they realize that the North Korean Special Forces are aware of their mission and are attempting to capture the two Canadian spies. To throw the North Koreans of their tail, Logan comes up with a dangerous plan. Leaving Miko, he attacks a North Korean personnel carrier with his Heckler-Koch HK G36 assault rifle, killing the driver. The truck loses control and plows into Logan , carrying itself and Logan into the lake. As Logan goes underwater, he is attacked by a North Korean officer from the truck. Logan quickly kills the man and swims underwater to the far side of the lake, successfully faking his own death. Badly wounded and exhausted, Logan crawls away from the lake and rendezvouses with Miko, collapsing in a hidden shelter that she built in the nearby woods. She informs him that the North Koreans captured Langram, but seem to have been taken in by his ruse. Logan reveals to Miko that he is a mutant, mentioning that he found out a few years before. Logan soon realizes that the North Koreans are still searching for him, a suspicion punctuated by the sound of dogs tracking his scent. 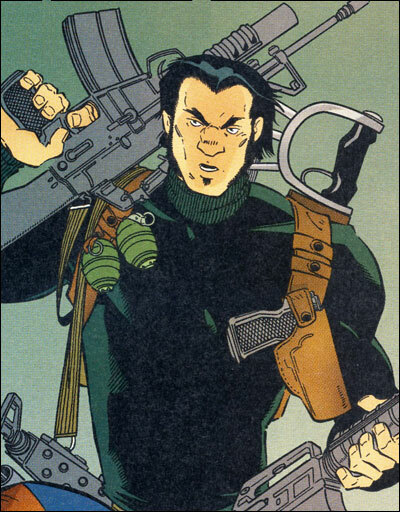 Logan leads the dogs, soldiers, and helicopters tracking him away from Miko, giving her time to break into the North Korean facility to rescue the Japanese scientist and Langram. Using all of the tricks learned from his youth, Logan finally makes it to a clearing where he is sighted by a sniper aboard a pursuing helicopter. Logan fires his M9, killing the sniper, and lobs a hand grenade into the helicopter. Unfortunately, two more helicopters follow, forcing Logan into the hands of the North Korean troops on the ground. Logan kills three of the soldiers, including an officer, but is soon beaten into unconsciousness. Logan wakes up in a North Korean jail, cellmates with Langram who explains that he discovered North Korea’s secret: they are producing a new strain of deadly nerve gas. Before long, alarms go off, and the Canadian agents are rescued by Miko. Logan, Langram and Miko fight their way through an onrush of North Korean soldiers, finally locating the Japanese scientist, Dr. Inoshiro Katana, who turns out to be Miko’s father. Because her father is near death due to his savage treatment at the hands of the North Koreans, Miko, for the sake of family honor, is forced to kill him. Escaping from the facility, Logan , Langram and Miko silently kill several more guards and steal a North Korean personnel carrier. Racing towards the extraction point, Langram plows the truck through an electrified chain link fence and gets them within a kilometer of their destination when a tank blows up their APC. Logan and Miko are thrown free from the APC , but Langram, unconscious and injured, is still strapped to the driver’s seat. With Miko’s shoulder injured, Logan frees Langram and begins to carry him to the extraction site. Miko stays behind to slow down the oncoming North Korean soldiers, but they are all quickly rounded up. The North Korean officer kills Miko with a shot to the head, sending Logan into a rage. He kills the officer with his knife and escapes into the woods. Then with a berserker rage building, Logan’s bone claws emerge, and Logan gives into his animal nature. The carnage is staggering as Logan kills scores of North Korean soldiers. Before long, a MH-60 Pave Hawk helicopter, with men who will later work at Experiment X, arrives and picks up Langram and Logan. Logan is barely conscious, a look of extreme savagery playing across his face. Tomm Coker and Keith Aiken, Logan: Shadow Society. In a rundown section of Toronto, a young undercover CIA operative, Carol Danvers, runs a sting operation to catch an arms dealer, Jacques Preen, who is working the Canadian-American border. When Danvers’ cover gets blown, Logan, acting as backup, quietly disposes of Preen’s four hired thugs and then subdues Preen himself. Afterwards, Logan and Carol reminisce about “old times” until they are notified that Logan’s partner, Neil Langram, has just been murdered. One hour later at the crime scene, Logan searches for clues, but is badgered by Sidney Hallorman, an overbearing bureaucrat from the Defence Ministry. When Hallorman claims Langram was a traitor, Logan goes after him, but Malcolm, an Internal Investigations specialist, orders Logan to back off and drop all involvement in the case. Malcolm does seem to carry some weight with Logan, as Carol is able to convince Logan to leave the crime scene without further incident. Later that evening at Logan’s apartment, Logan and Carol try to break into the Defence Ministry’s computer database using Logan’s new experimental “personal computer.” The computer blows up, signaling to Carol that it is time for both of them to get some rest. Several hours later, Logan is woken up by the barely-audible sound of an intruder with a silenced nine-millimeter automatic. As his apartment bursts into flames from the attack of another assassin, Logan escapes through the window and calls in for a safe house. At the designated pickup point (an empty hockey rink), Logan again finds himself under assault by two hostile operatives. Logan incapacitates both but fails to learn their identities. By the wee hours of the morning, Logan arrives at Carol’s hotel room, only to find that she has killed the four attackers dispatched to kill her. The scene moves to the dark sub-basement of the Canadian Ministry of Defence, where the early stages of the top-secret Department H are underway. Logan and Carol break into the onsite computer database and discover evidence of the “Mutant Agenda,” consisting of a list of suspected genetic mutants, and suspicious individuals who would expose the existence of said mutants. Logan’s name is on the list as a suspected mutant, and, slated for silencing is Dr. Perry Edwards, the author of the book, “Shadow Society,” that documents the emergence of super-powered mutants within human society. Four hours later, Logan and Carol track down Dr. Edwards in New York City and save him from two assassins who have followed him to Greenwich Village. As Edwards explains the details of the mutant hierarchy to Logan and Carol, he shows them the Hellfire Club, a prestigious club on the verge of becoming a breeding ground for mutants bent on dominating humans. Logan breaks into the club and learns of a Canadian installation that is imprisoning mutants, before being forced out by Hellfire Club guards. By the following day, Logan and Carol have located and broken into the Canadian installation. As they investigate, Logan comes face to face with Creed (Sabretooth) who has strung up the bodies of his most recent kills: Dr. Edwards, Malcolm, Hallorman and three unnamed American agents involved in the “Mutant Agenda.” As the two face off, Creed implies that Logan is a mutant, and was to be recruited for the coming battle over mutant supremacy. He further explains that he personally killed Neil Langram over his refusal to join up with Creed. Logan finally loses his cool and plunges his sizable knife into Creed’s chest. But Creed is able to detonate a bomb, blowing up the entire facility. Logan and Carol barely escape with their lives, as Logan ponders the very real possibility that he is, in fact, a mutant. This is the second one-shot in 1996 by Howard Mackie relating to Logan’s past and contains many interesting tidbits. The Canadian intelligence agency that Logan and his partner, Neil Langram, work for is so secret that even the Canadian Prime Minister is unaware of its existence. When Creed appears, he boasts of his long history with Logan, specifically the settling of old scores and the safety of helpless women. Carol Danvers makes an appearance as an old intelligence friend of Logan, even though she is clearly under the age of 21. The beginnings of Department H are shown to be closely tied to the “Mutant Agenda,” and Logan obviously suspects that he is mutant. Finally, the appearance of Warren Worthington as a youngster at the Hellfire Club suggests that his story takes place in the late 1950s, since he will be a teenager in 1964. Logan, working for Canadian Intelligence, is sent to the Soviet Union to help Dimitri Suhkarov, a Soviet nuclear arms designer, and his daughter, Viktoria, defect. Several days later, Logan has managed to bring them to a bridge crossing the Yensei River in Siberia, but they are closely pursued by a top Soviet Intelligence agent, Ilya Dubromovitch Skorzorski, code-name Volk (Russian for Wolf) and three young Soviet soldiers. Logan sends the father and daughter across the bridge to meet up with a plane waiting to take them to safety and backtracks to confront his pursuers. While he is able to kill the three Soviet soldiers, Logan does suffer several gunshot wounds to his chest. As Volk closes in on the Suhkarovs, Logan tackles him behind and wrestles him to the ground. But Logan’s wounds slow him down in the ensuing fight, and Volk emerges victorious, shooting Dimitri Suhkarov dead. Before Logan can recover, Volk departs, acknowledging Logan as a worthy adversary and leaving Logan and Viktoria Suhkarov to escape with their lives. As an interesting side note, Logan shows himself to be fluent in Russian. As Logan is being prepared for the Experiment X program, Carol Hines pulls up his Medfax file that notes that Logan had been shot at least five times prior to his capture, four to the trunk and once in the leg. Presumably, one of the torso wounds was inflicted during Logan’s mission to Siberia. According to official records, Logan was suspended from Canadian Intelligence for critically wounding a firing range worker (entry wound near the left temple) during a gun mishap, despite being an expert marksman. 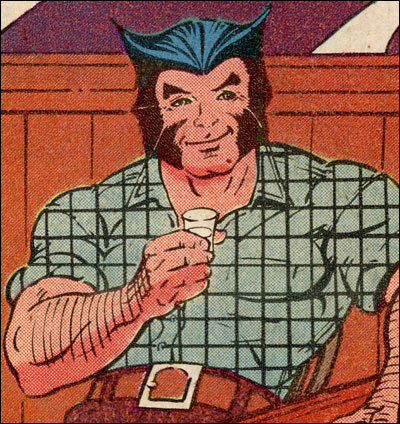 During a subsequent investigation, it was noted that Logan suffered from self-destructive tendencies resulting from chronic alcohol abuse. It is further noted that he had a morbid occupation with the current “mutant” hysteria brought on by possible psychosis. It is further warned that extreme care should be taken with him due to his violent nature. 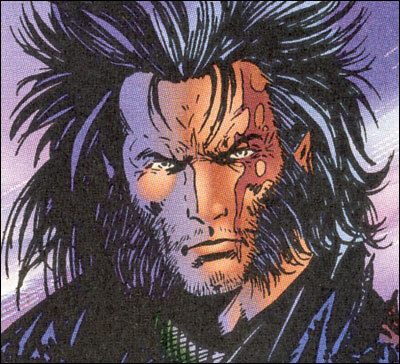 According to Barry Windsor-Smith, “It’s apparent that in the early ’60s, when Logan worked for some sort of Secret Service in Canada, he was also using drugs and was an alcoholic. His life was absolutely meaningless. He had been fired for a mistake at a firing range. It’s kind of funny. He blows this guy’s head off with a .38 revolver. And Logan’s attitude is, ‘I winged the guy. So what?’ And the only reason he did that was because he hands were shaking because he had been drunk the night before. After being let go from Canadian Intelligence, Logan ‘s reputation brings “…an unending line of young punks or fading old-timers always there to challenge him.” But it allows Logan to get jobs interacting with the underworld, seemingly working with arms dealers. On one specific deal, Logan is summoned to meet Rene St. Exeter , a pretentious gunrunner, to collect his cut of the profits. St. Exeter attempts to double cross Logan, claiming the air-to-air missiles Logan procured for use in Latin America were of inferior quality. Logan quickly retaliates, killing St. Exeter’s bodyguards, but St. Exeter escapes during the bloody mayhem. Disgusted with the situation, Logan heads for the Yukon in his Lotus 7. One month after the events of the “Mutant Agenda” fiasco, Logan calls Carol Danvers at a secluded safe house as she recuperates from her injuries. Carol notes that no trace of Creed was found at the remains of the Canadian installation. Logan comments that his reputation is dirt with Canadian Intelligence ever since he started talking about the “Mutant Agenda” conspiracy. The call ends with Logan mentioning that he is heading up to the Yukon for a bit of a break. Larry Hama Interview, February 5, 2000, FFPlaza.com. 1 Comment on "013: Secret Agent Man, Eh?" The secret agent stuff has always been really interesting to me. I also like his Department H adventures. I’ve always felt there was more room to explore these areas of Logan’s life. Didn’t Deadpool fight him a few times, while he was working in Department H?